One of the most frustrating issues to deal with as a parent, in my opinion anyway, is trying to figure out how to get kids to listen the first time you ask them to do something without having to repeat yourself, raise your voice, and implement consequences. Having a child who continuously struggles to listen and follow directions can make you feel ignored, disrespected, and out of control, but thanks to these tips, tricks, and activities, you can learn how to get your kids to listen the first time you ask them to do something without power struggles and shouting matches. If your child is in the middle of play, the best way to make sure they not only hear you, but also take in and understand what you say to them is to ensure you have their attention in the first place. Before you start speaking, turn off distractions, touch your child lightly on the shoulder or back to get their attention, and ask them to look you in the eye. Next, ask them to repeat what you’ve said to get a verbal confirmation that they’ve understood you. It may seem a bit silly, but if you consistently struggle to get your little one to listen to you, it’s worth the upfront effort! As tempting as it is to repeat yourself over and over again when your child isn’t listening to you, it can cause you to become frustrated while simultaneously teaching your child they can continue to ignore you until you reach your breaking point. A much more effective strategy is to turn distractions off and wait for your child to follow through on all requests you make of him or her. This will take some practice, but if you take corrective action the moment your child ignores you rather than repeating yourself to the point of annoyance and frustration, your child will soon learn what is expected. If your child continues to ignore your requests despite your best efforts to ensure he or she has heard and understood you, implementing consequences can be an effective technique to nip bad behavior in the bud. To be effective, consequences must be used immediately following an undesirable behavior has occurred and they must be appropriate for the situation and age of the child. Make sure not to blow things out of proportion, and always follow through! When trying to convey a message to your child, you’ll have better luck and get the results you’re after if you simplify your message. Focusing on ONE thing at a time not only ensures your child doesn’t get overwhelmed and distracted, but also increases the likelihood that he or she will remember what you’ve asked of him or her and retain any lessons learned for the future. Learning how to get kids to listen and figuring out a strategy that works for your individual child can be emotionally draining. Trust me, I know! No one enjoys being ignored and disrespected, and while it can be very easy to lose control and react in anger when your child continuously ignores you, we must remember that we are our children’s most important teachers. They mimic us every chance they get, and if we want to teach them how to conduct themselves appropriately, we must first take ownership of our own negative tendencies. Angry moms raise angry kids who grow up to be angry adults, so if we want to break the cycle, we must start with ourselves first. By staying calm and actively figuring our how to get kids to listen without angry outbursts, we can set them up for long-term success. When trying to figure out how to get kids to listen, we often forget to see things from the perspective of our children. While it may seem like they are deliberately ignoring us and pushing our buttons, that is rarely the case. Kids typically want to please their parents and caregivers, but oftentimes they struggle with transitions and find it difficult to move from an activity they enjoy to something less desirable. Remember to get down on your child’s level when speaking to him or her so you can see the world through their eyes, and offer compromises wherever possible. One of the best ways to engage with and teach children is through play, and if you’re trying to crack the code and learn how to get kids to listen the first time you ask them to do something, give some of these listening activities for kids a try. They offer a great way to have fun at home and in the classroom while also providing opportunities to teach children important life lessons and improve their memory. 26 Screen-free Memory Games for Kids and Families | What Do We Do All Day? Learning how to get kids to listen is no easy task, but when you actively ensure you have your child’s attention before speaking with them, keep your requests simple, stay calm, and remember to compromise, you will not only improve your child’s listening skills, but will also teach other important life lessons, like compromise, obedience, and respect. 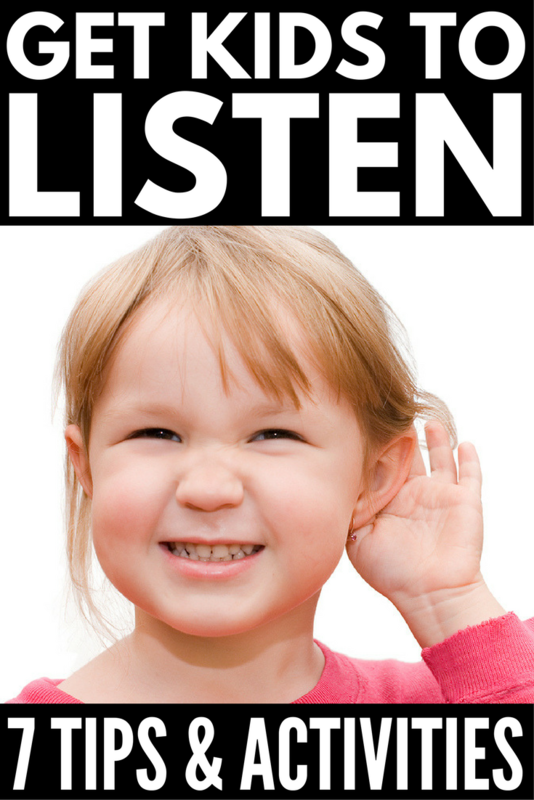 If you found these tips to teach you how to get kids to listen helpful, please share this post on Pinterest!